The very limited Joyetech ESPION Solo is now available for preorder. The Joyetech ESPION Solo Kit comes with the ProCore Air atomizer. The ProCore Air atomizer uses the new ProCA coil heads which only produces flavorful clouds. Now if you don’t think this device could get any better, the Joyetech ESPION Solo mod also comes with a touch screen interface on its 1.3 OLED screen. 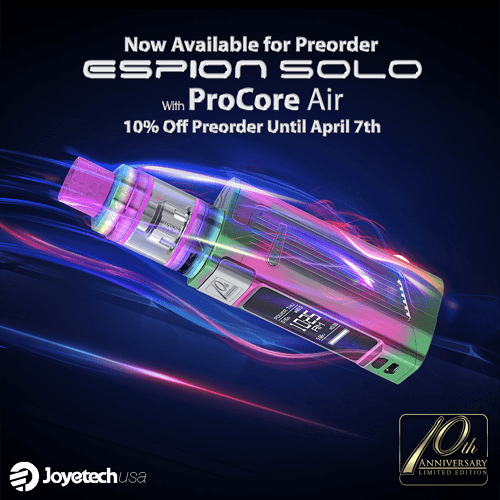 A celebration of the 10 year anniversary of Joyetech, calls for a celebration and this is the perfect way, with the Joyetech ESPION Solo! Don’t miss out on the Joyetech ESPION Solo Kit if you preorder today you get 10% off the device! Don’t like the black colorway? 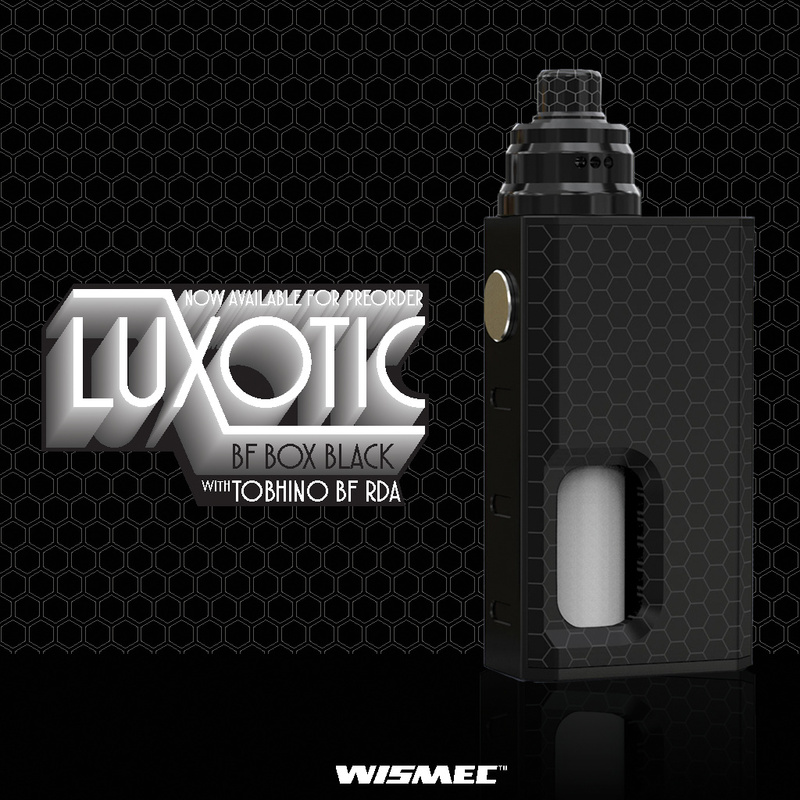 Well we have all the other colors in stock for the Wismec Luxotic. I was just curious about your postings here. All the links provided have been directly to the brand’s site and not your own. Do u have a vendor site or merely drawing attention to manufacturers? We have a vendor site and also associated with the USA distribution of Joyetech, Eleaf, and Wismec. This tiny box mod is equipped with the GS Baby which uses GS coils. The Eleaf iStick Pico Baby mod utilizes a couple unique innovations that aren’t usually seen on a normal mod. First the Eleaf iStick Baby features a magnetic connected atomizer, no unscrewing just pull out and put in when it comes to taking out your GS Baby. Second the Eleaf iStick Baby mod also features a unique button lock, screwing it unlocks the button and then screwing it back locks it, letting you fit this device in your pocket with no worries of the device firing. The Eleaf iStick Baby is constructed of stainless steel for durability and feel. Although this mod is small, it’ll surprise you with the major things it can do. 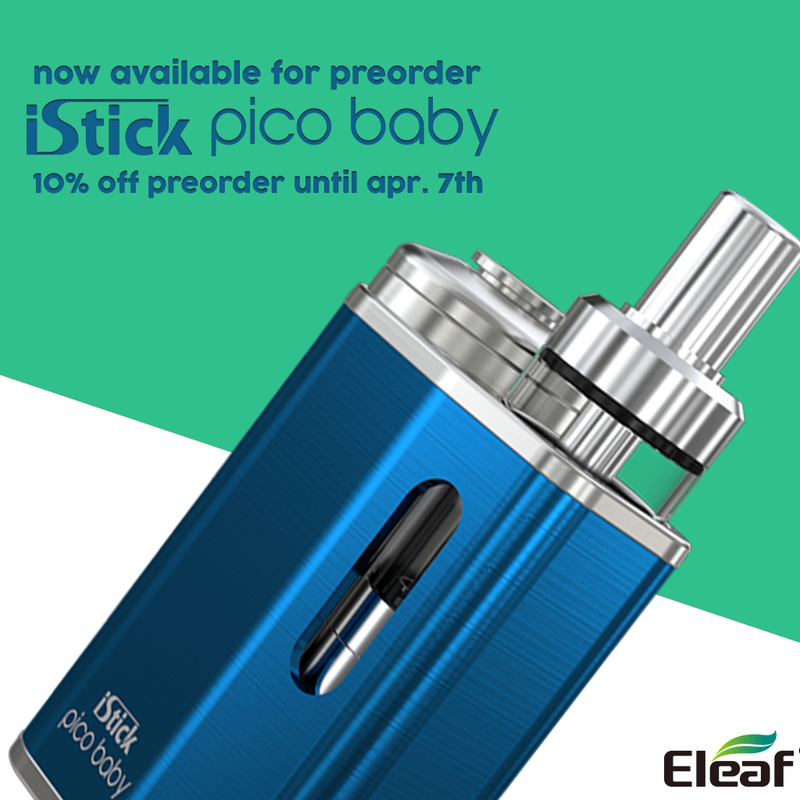 If you preorder the iStick Pico Baby now you get 10% off! i found it myself. What i meant was that you don’t have a link listed here but here it is w/ a nice deal on a pico25 which ive been looking for for someone. Welcome Mist Vapor! Happy to have you aboard. We’ve been currently focusing on the new products that have recently come out, we will be posting about our devices, deals, and discounts shortly! Np, just a simple link to your site to help us bargain hunters browse your wares as the saying goes. I look forward to it! Let the shopping begin. The Wismec Sinuous RAVAGE230 is a two cell mod with a centered 510. The Wismec Sinuous RAVAGE230 utilizes the Gnome Evo atomizer which uses a WM series coil. The Wismec Sinuous RAVAGE230 mod with the Gnome atomizer is a perfect couple together that produces great clouds and flavor, with looking great too. The Wismec Sinuous RAVAGE230 interface is unique and easy to use, letting the vaper navigate and change their preferences easier. The Eleaf iJust 3 with ELLO Duro atomizer features a new reimagined net and multi hole coil heads. The Eleaf ELLO Duro also features a new bubble glass atomzer with 6.5ml/2ml options for more or less juice capacity, along with having an easy to use retractable top fill. The Eleaf iJust 3 mod has a max output of 80W, a great tube mod with an exception performance. 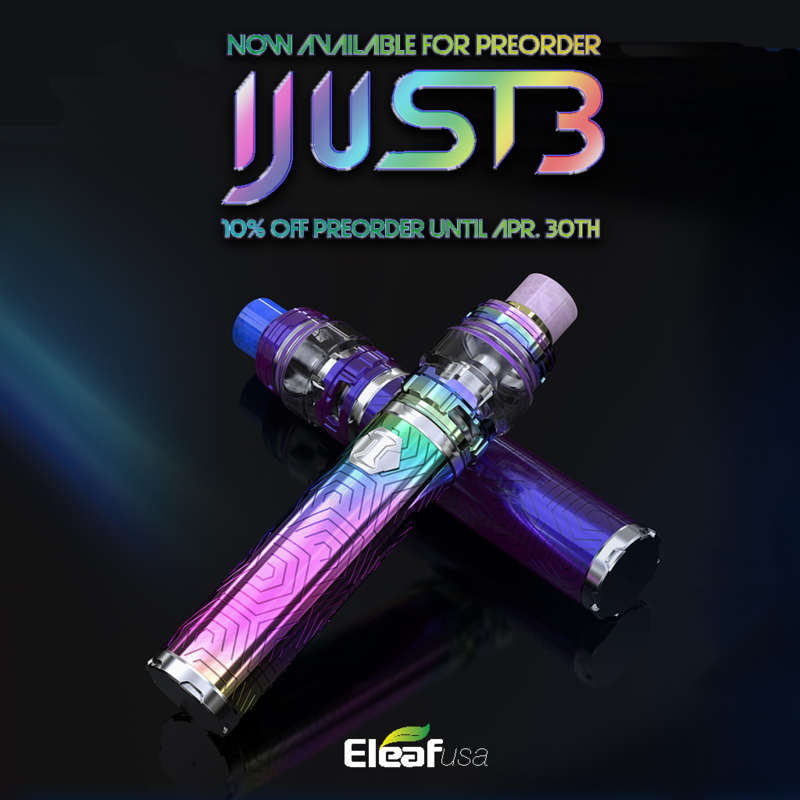 Order the Eleaf iJust 3 kit today and get 10% off. 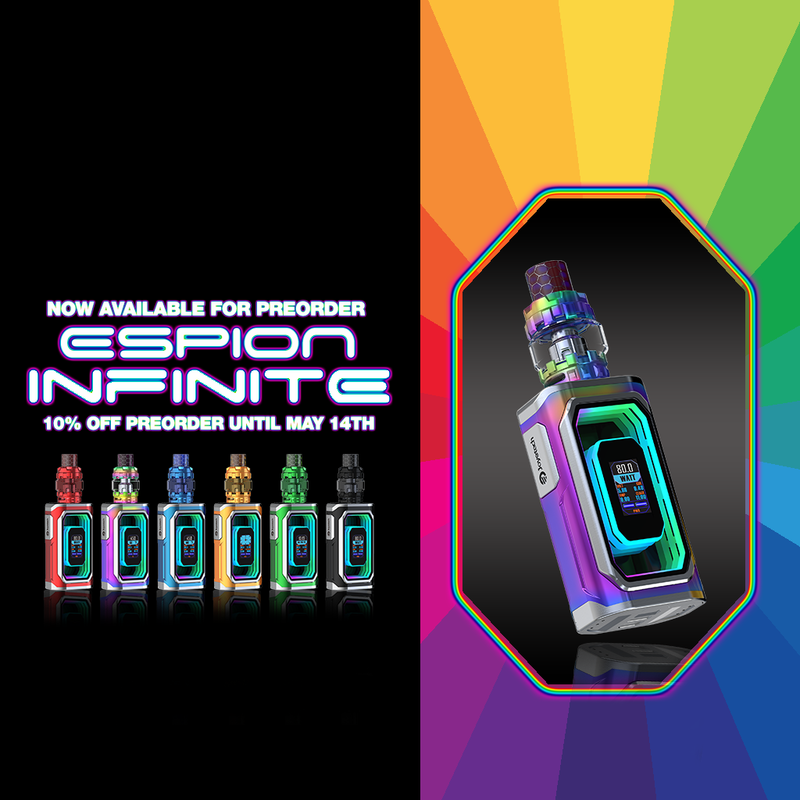 The Joyetech ESPION Infinite kit is now available for preorder! This brand new Joyetech ESPION Infinite features an infinite mirror of color that this device exhibits. The Joyetech ESPION Infinite mod is a 230W two cell device that uses both 18650 and 21700 batteries. Along with featuring magnificent display of color The Joyetech ESPION Infinite also features the brand new Joyetech ProCore Conquer atomizer. The Joyetech ProCore Conquer utilizes the ProCD coil head that uses the new net/mesh coil system. Experience a wonderful spectrum of color with the Joyetech ESPION Infinite kit. Preorder the Joyetech ESPION mod today and get 10% off! The Joyetech ProCore Air Plus atomizer is Joyetech’s first bubble glass atomizer that utilizes the ProCA coil head. The Joyetech ProCore Air Plus also features a stylistic drip tip that can be switched out with the other variety of drip tips. The bubble glass on the Joyetech ProCore Air Plus is also switchable as well, which also comes with different patterns and colors. 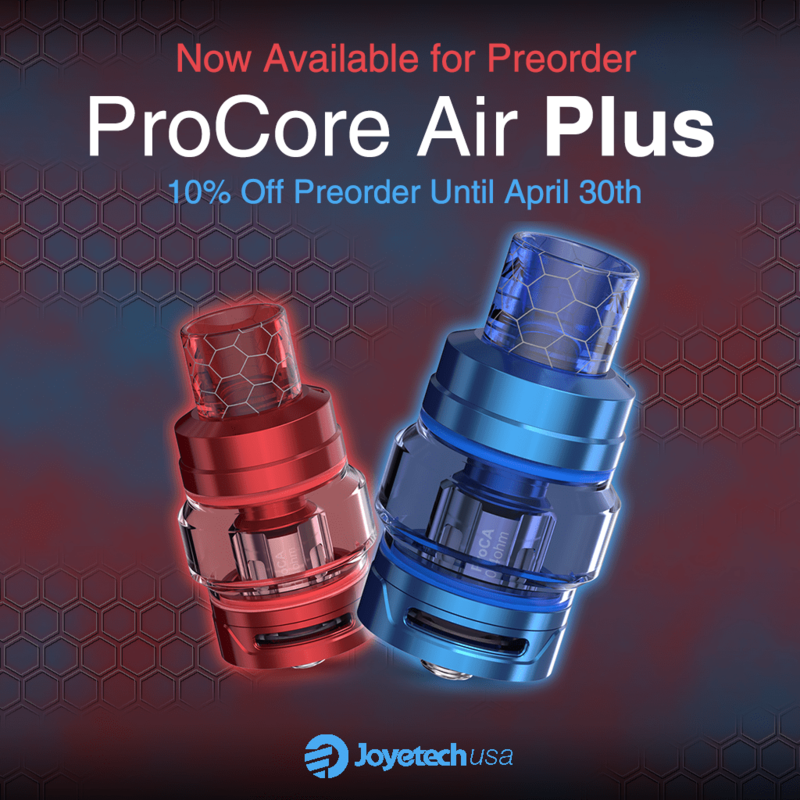 Preorder the Joyetech ProCore Air Plus atomizer and get 10% off! The Eleaf iStick Pico S is the newest iStick Pico to join the Eleaf family and probably the most unique one to date. Being powered by either an 18650 or 21700 battery, this single cell device has a bare battery tube with a corroded texture design. The Eleaf iStick Pico S kit has a maximum wattage of 100, being one of the strongest iStick Picos to date. The Eleaf iStick Pico S mod also features an LED detail that you can customize with any color. The [Eleaf iStick Pico S kit] (https://www.eleafus.com/new-arrivals/istick-pico-s-with-ello-vate-no-battery.html) comes with the Eleaf ELLO Vate which utilizes HW net and HW multihole coil heads that utilizes the mesh style coils. 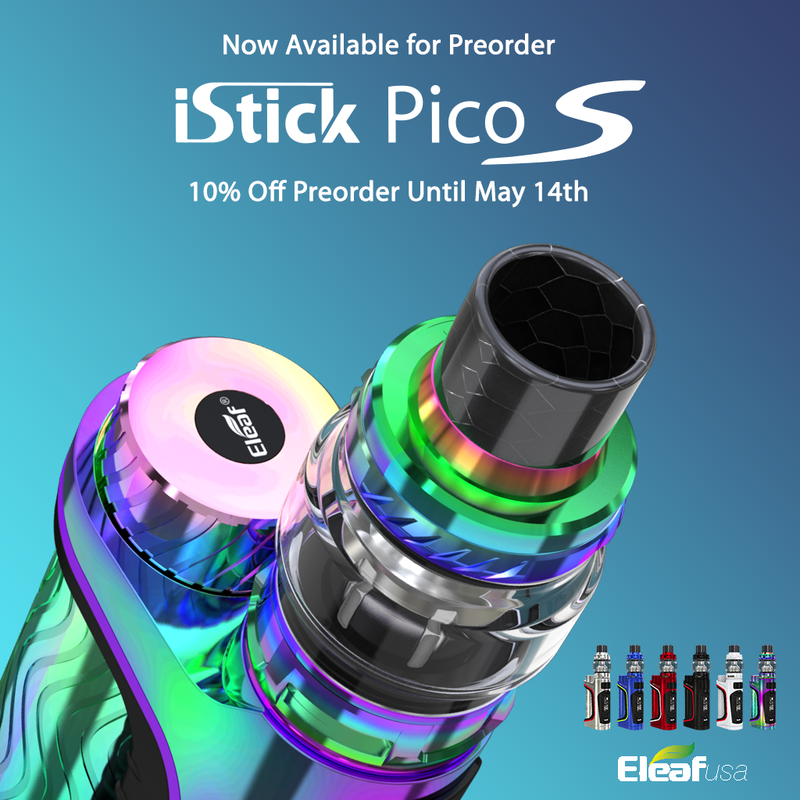 Preorder the Eleaf iStick Pico S mod and get 10% off! The new Joyetech Batpack with Joye ECO D16 atomizer is one of the first devices to use AA batteries. An obvious power source, but only a finite of devices have ever used these kinds of batteries. 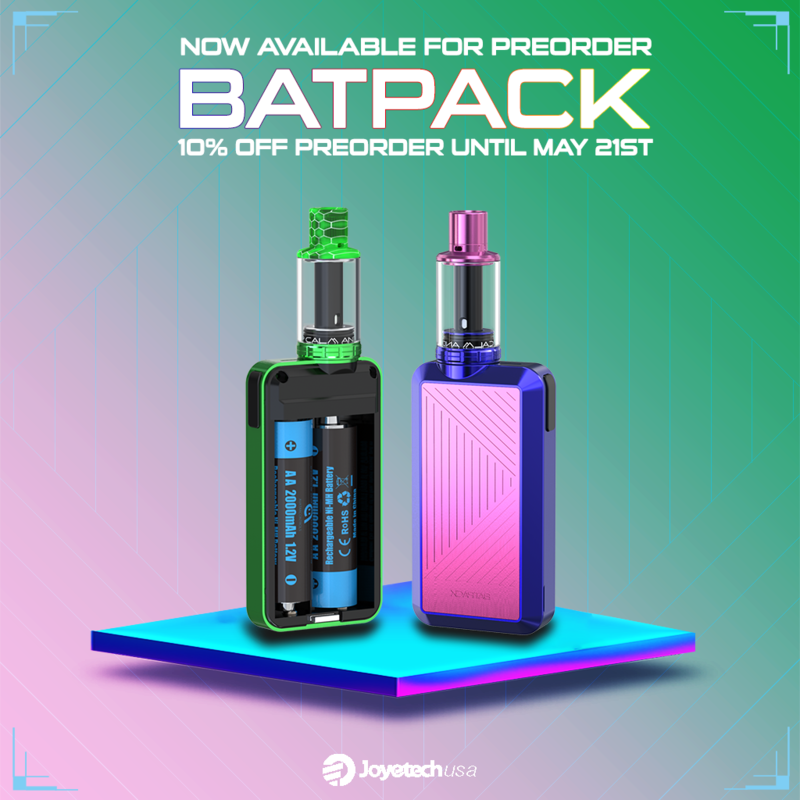 The Joyetech Batpack kit comes with the Joyetech Joye ECO D16 atomizer that’s primarily used for nicotine salts with restricted airflow, along with its restricted airflow the Joye ECO D16 can also have the best experience at a low output. Users shouldn’t fret when they hear it uses AA battery because the Joyetech Batpack mod comes with a rechargeable Avatar AA battery. Preorder the Batpack today and get 10% off! The Wismec Sinuous RAVAGE230 just got a huge upgrade, the Wismec Sinuous RAVAGE230 mod is now paired with the Wismec GNOME King atomizer. Along with the new Gnome King tank, there are also 3 new colors to the Wismec Sinuous RAVAGE230 mod. The Wismec GNOME King utilizes the WM-M coil, which is a multi-hole mesh coil head. The Wismec GNOME King tank also has a straight glass or bubble glass options, giving you more choices with your vaping experience. The Wismec Sinuous RAVAGE230 kit was already a savage device, but now paired with the GNOME King, it’s a match made in heaven. Preorder the Wismec Sinuous RAVAGE230 with GNOME King atomizer and get 10% off! Wismec Sinuous P80 is now 30% off! The Wismec Sinuous P80 is a one cell mod with a max output of 80W. The Wismec Sinuous P80 is paired with the Elabo Mini , perfectly centered 510 with the WS series coils . Being a one cell mod, this mod will make you think you’re holding a box mod, with the amount of clouds and flavor that the Sinuous P80 will give you. The design of this mod gives a simplistic, yet modern look. The Sinuous P80 Kit is now 30% off! Take advantage of this deal here.